The above is a photograph of my Mustang Bullitt. Ford manufactured only 723 True Blue Mustang Bullitts in 2001. I was very lucky to score one of them. To my surprise, this photo has received quit a bit of attention in the Flickr community. The funny thing is, I spent all of about 15 minutes to shoot it. I honestly did not expect this shot to be so well received. I just discovered recently too that this was my first photograph to ever get Explored on Flickr. Much gratitude to each and everyone on Flickr who has commented on and favorited this photo. I appreciate the support more than I could ever say. The inspiration for this photograph came from the weekly photo contests on the Digital Photography School forums. Every week, the member forums on DPS hosts a themed photo contest where its forum members are encouraged to capture a photograph relating to the weekly theme and post it online. The theme for the week that I captured this photo was “Zoom While Shooting“. Most of the participants attached their zoom lens to their camera and fired away by manually zooming in or out with their lens. I decided to take a slightly different approach. I manually zoomed the camera by attaching it to my car and accelerating. Capturing this type of photo is very simple and requires very little prep work. Be warned though, do not attempt to try this unless you feel very confident in what you’re doing. I will not be held responsible for anyone who breaks their camera while attempting this type of shot. With that said, please proceed with caution. You will need a camera that comes with a timer to delay the shutter and also has the ability to manually set the shutter speed. If you have a remote shutter release for your camera, you can attach that and use it instead of the timer. Your camera will need a wide angle lens. If your camera doesn’t support interchangeable lenses, you basically need to zoom out as far as you can. They objective is to have a large field of view. The last component you need, and perhaps the most important piece of it all, is a Gorillapod. The Gorillapod is a flexible mini tripod made by Joby. Step 1: Thread the Gorillapod onto the camera. Step 2: Attach the camera to the driverside rear view mirror on your car by wrapping the legs of the Gorillapod around the mirror. It is important that you secure the Gorillapod and camera to the car very carefully. If it’s too loose, you will run the risk of dropping the camera when your car begins to accelerate. If you your camera hits the pavement it’ll be game over before you realize what happened. Step 3: Set your camera’s timer to release the shutter after a set amount of time. You will need at least 5-10 seconds. If you plan to use a cable shutter release instead, go ahead and attach that now. Step 4: Set your shutter speed to between 1 and 5 seconds and adjust your aperture to be reasonably small, around f/8 to f/13. Step 5: Climb inside the car, shut the door, and start the engine. Step 6: If you’re using your camera’s timer function, roll your window down, push the shutter button on your camera, and then proceed to accelerate. Your shutter should open after you’re already accelerating and close before you stop the car. If you’re using a cable shutter release, begin accelerating first and then push the shutter release. You do not need to be traveling at a high rate of speed to do this. If you’re driving faster than 5mph, you’re probably driving too fast. They key is to prevent the camera from falling off of the mirror. Capturing long exposure shots when it’s bright and sunny out will usually make for an over exposed photograph. Unless you plan on using neutral density filters in bright daylight, I would advise doing this at dawn or dusk when the sunlight isn’t too powerful. It’s best to remain as patient as possible. You’ll likely need to try several times before you get that final money shot. If you find yourself getting frustrated, take a break for a few minutes. 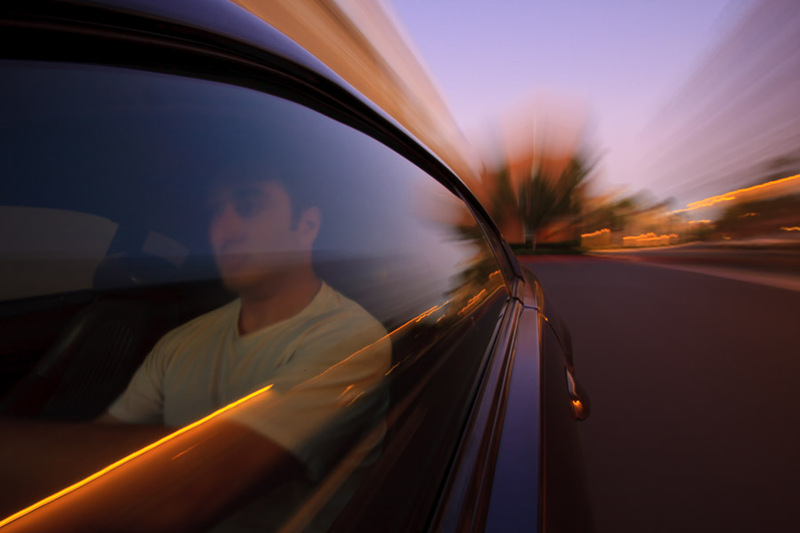 If your photo is too blurry, make sure you accelerate your car as smoothly as possible. If your shots are still too blurry, try shortening the amount of time you’re leaving the shutter open. There isn’t one magic formula for this but the steps above will give you a good starting point. Don’t be afraid to experiment and try different techniques. The important thing is to have fun with this. Be sure to hit me up in the comments if you have any questions or if you would like to share your shots. Very nice shot. I’m will give this a try. I’d be scared to try that – if that camera drops, it’s gone! Great shot. You mentioned rear view mirror instead of – Side view mirror drivers side. You must have used small point and shoot or DSLR camera? Thank you! You are correct, I mounted it on the side view mirror on the driver side. I used a Canon 40D dslr to shoot this. Thanks for the feedback. I’ve been trying to figure out how to capture motion blur with a mobile phone camera but have been unsuccessful so far. You did a fantastic job at doing this. Thanks for sharing. Very nice shot. What time of day did you shoot this? Thank you! I shot this at sunset, the sun had already set beyond the buildings in the background, which allowed me to leave the shutter open longer without over exposing the photo. That’s a very good idea, I will try that next time. Thank you for the tip.